genres are formal structures that have a historical existence in the sense that they come into being, flourish, and decay, waxing and waning in complex relationships to other historical phenomena. Genres are contingent in the sense that they aren’t necessary: neither their nature nor their transformation, neither their continuity nor their discontinuity, can be predicted in advance. What is at stake in establishing an identity for a genre as a historical phenomenon? In The Chinese Political Novel: Migration of a World Genre, Catherine Vance Yeh provides a historical approach to the Chinese political novel by systematically reclaiming a vast and yet scantily studied corpus of texts that enjoyed a phenomenal rise and immense popularity in the early decades of the twentieth century. Additionally, she traces the global origins of the political novel genre in mid-nineteenth-century England and the United States, tracking this new form of political fiction as it reached East Asia, first flourished in Meiji-era Japan, then spread to late Qing China. Yeh delineates the migratory pathways of the political novel as a “world genre,” mapping the transnational flows and the transcultural processes through which it achieved its meteoric rise as a worldwide phenomenon. Along the way, she demonstrates how the newly wrought narrative form modeled itself on established popular novel formats, “moving from lowly entertainment to the new global leading literary genre,” one that was primarily concerned with the nation’s future (3). In dialogue with Pascale Casanova, Franco Moretti, David Damrosch, and other scholars of “world literature” who conceive of “the dynamics of literature as interconnected strands in a world literature” that transcends the bounds of nations and languages (p. 5), Yeh seeks to demonstrate that the transnational literary intervention of the political novel as a world genre indeed “played a role in reconfiguring the local standing of the fictional genre more generally” (p. 3) and to offer an alternative commentary on the evolution of modern Chinese fiction. 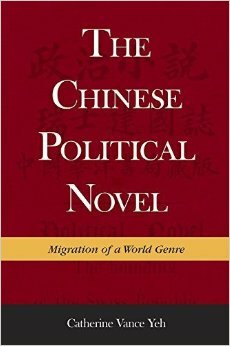 The Chinese Political Novel is comprised of two parts. Part 1, “The Formation of a World Genre: The Political Novel,” locates the rise of the political novel in nineteenth-century Europe and America. Yeh identifies core literary features of the early Western exemplars of the genre, indicating how the transportability of these features across national (and continental) and linguistic borders fueled the political novel as a world genre. Chapter 1, “Forming the Core,” centers on the formation of the genre in Europe and America. Acknowledging the various and controversial claims on the “origin” of the political novel, Yeh begins with British statesman and writer Benjamin Disraeli’s Coningsby, the first novel in his Young England trilogy, as the progenitor of the genre. She then moves to Giovanni Ruffini’s Lorenzo Benoni, or Passages in the Life of an Italian, a political novel that promoted the cause of Young Italy and national independence. The American political novels mentioned include Henry Adams’s Democracy and Edward Bellamy’s Looking Backward. Yeh does not consider Uncle Tom’s Cabin as a representative of the political novel per se because it “belongs to the sentimental novel genre that emerged in the eighteenth century” (35), though it should be said that Harriet Beecher Stowe’s novel had a profound impact on American political life and generated deep resonances in late Qing China through Lin Shu’s translation and other dramatic adaptations. Yeh also traces the growth of the genre through its early migration to the Philippines, via José Rizal’s two political novels written about the Philippine independence movement, Noli Me Tangere and El Filibusterismo. At the end of the chapter, Yeh identifies core features of the political novel shared among its generic cousins in terms of themes and literary strategies. Thematically, Yeh emphasizes that “the subject matter of the political novel is the nation,” whereas the genre is “tied to a reformist agenda,” “often with the allegory of ‘youth,’ the political forces that could be the mainstay of the reforms” (50). In terms of literary strategies, Yeh identifies the following features: the present as “the time horizon of the narrative”; the political reformer as “a new hero”; plots fueled by an evolutionist worldview; and dedication to “rational political dialogue among friends” to resolve “controversies about the path the nation should take” (51–52). Concrete as they are, Yeh’s thematic and stylistic categorizations can at times come across as schematic attempts to overcome and stabilize the fuzziness of the political novel during its inception as a global genre, developed as it was by authors of disparate socio-political backgrounds—elite statesman and minister (Disraeli), descendent of U.S. presidents (Adams), religious socialist (Bellamy), anti-(European) colonialist and Filipino nationalist (Rizal)—impacting on presumed readerships (Ruffini’s English novels and Rizal’s Spanish work were first published outside of their native countries). Furthermore, Yeh subsumes these authors’ diverse ideologies and agendas—reform, revolution, nationalism, post-colonialism—under an evolutionist historicism. In addition to the core features consistently retained in the genre’s multifarious versions across the globe, Yeh in her subsequent analyses of individual works pinpoints the importance of peculiar narrative conventions that particular authors appropriated from their domestic literary heritage and culture in interaction with local audiences and political authorities. Chapter 2, “Global Migration: The Far East,” reflects the book’s ambitious attempt to chronicle the transnational development of political novels as they extended into East Asia through both translation and re-creation by local authors. For researchers interested in the evolution of the modern Chinese novel, this chapter provides an informative outline of the trajectory of interflows between Japanese and Chinese political fiction. Meiji-era Japan, especially during the late nineteenth century, experienced a flood of political novels; in addition to translations of Western works such as Disraeli’s Coningsby, intellectuals used the genre for political advocacy and it was largely through indigenous writers’ creativity and experimentation with new rhetorical tropes and plot patterns that the genre took root in Japan. Particularly illuminating is how a novel like Toda Kindō’s Stormy Seas of Passion (Jōkai haran) deployed the Chinese “scholar and beauty” (才子佳人) plot formula to allegorically encode Western notions of liberty and reform within a Chinese sentimental love story between a beautiful lady and a talented young hero. Yeh suggests that these emerging Japanese political novelists enthusiastically embraced the Western subjects of liberty and individual rights and embedded them in a Chinese narrative model. A more intimate circuit of Chinese and Japanese literary interaction is evident in Tōkai Sanshi’s Mysterious Encounters with Beautiful Women (Kajin no kigū), a novel that intermingles romance with politics. Liang Qichao promptly translated it into Chinese and serialized it in his newly founded journal The China Discussion (清議報). Although both the Japanese original and Liang’s translation open a new horizon on world history from the perspective of oppressed people and nations, Yeh reminds us that the latter half of the Chinese rendition contains Liang’s deliberate alterations of the text so that “the translation is geared toward Chinese needs and sensibilities” (85). Chapter 2 also provides an informative elaboration of the “future record” (miraiki) mode of Japanese political novels and Liang’s transcultural negotiation with Japanese antecedents. Yeh believes Liang’s own well-known novel, Future Record of New China (新中國未來記), was directly inspired by Suehiro Tetchō’s Plum Blossoms Amidst the Snow (Setchūbai) and Future Record from Meiji Year 23 (Nijūsan nen miraiki). These works share the core narrative features of a futuristic work that “brings into focus the politics embedded in the scientific literary device of using a perspective of looking back from the future to advance a particular ideological point of view regarding the present society” (64). The chapter affirms the pioneering role of Liang as a cultural ambassador in importing the genre from Japan to China, arguing that Liang “offered a form that remained a dominant model for the next decade and encoded many of the new elements of the genre” (95). Yet, Yeh also observes that the flurry of Chinese political novels during this period makes it difficult to consolidate the form and its variations by exclusively following Liang’s model. This is owing, in part, Yeh notes, to the “fluidity” of generic boundaries, as “sometimes the borders between political novels and the large body of social exposé published during the same decade are hard to define” (97). Keeping in mind Yeh’s observations on the indeterminacy, unpredictable variation and dynamism inherent to genres in general, and considering the [Chinese] political novel’s unstable and nascent status as a genre at the time, we cannot exclude a number of other popular writers when considering which works to include under the category Chinese political novel. Readers may be reminded of the highly evocative middlebrow novels by Liu E, Wu Jianren, and Li Boyuan, and even Lin Shu’s translations, some of which were nonetheless engaged with the politics of the time but were often discussed under a different rubric, as discussed in Theodore Huters’ Bringing the World Home: Appropriating the West in Late Qing and Early Republican China. Huters’ book title clearly inspired the title of Part 2 of Yeh’s book—“Bringing the World Home: The Political Novel in China”—which is comprised of five chapters that explore the localization of the Chinese political novel in response to foreign (mainly Japanese) influences and reform governance in late Qing China, the Chinese genre’s search for new women and new heroes, and the formal innovation of the wedge chapter as a combination of modern and traditional Chinese narratives. Chapter 3, “The Migration of Literary Forms: Transcultural Flow and the Japanese Model,” continues Yeh’s discussion of the genre’s migration from Japan to China begun in chapter 2, offering synopses and brief analytic accounts of a number of Chinese translations and adaptations. Yeh argues that the foreignness of the imported novels fundamentally shapes an intrinsic “worldliness” of literary space in Chinese renderings of the genre: “In terms of space, each of these translations situates its action in the ‘world’ and not within the tightly sealed borders of one country” (115). The narrative space of the “world” is created “through the travels of the protagonists; through their interaction with foreigners; through their adoption of worldly ways, including foreign-sounding personal names; and, finally, through the ‘worldly’ nature of the genre of the political novel itself” (ibid). The author encourages a new approach to reading “these translations as integral parts of the Chinese-language fiction” (8). In chapter 4 (“‘Reform of Governance’ and the New Public Sphere”), Yeh emphasizes that Chinese political novels responded actively to the Reform of Governance (新政) in the last decade of the Qing dynasty, and novelists took up the task of reflecting or even criticizing the reform process. Yeh’s authoritative periodization (from 1900 to 1911) and accompanying socio-historical explanation in which the Chinese political novel genre is circumscribed by the period’s national reform agendas evokes critical questions when it is read alongside chapter 3, in which Yeh propounds the idea of the political novel as embracing the world, transcending the confines of the nation, and inserting China into a world context. This transcultural interaction and worldliness of Chinese political novels is just part of the story, and readers are reminded in chapter 4 of the periodization of the genre and the importance of nationhood to which the Chinese genre was inextricably tied. It begs the question as to how the nation-state—or precisely an anticipation of its imagined existence—could have played a role in encouraging and then delimiting the “worldliness” of the political novel in the last years of the Qing empire. One very suggestive scenario provided by Yeh is that the transnationality and worldliness of various late Qing translations of foreign political novels could indeed have served as a blueprint for nation-building exercises. By presenting foreign lands and people and by “bringing the world home,” these Chinese translations of foreign political novels served to open up new horizons and fuel the imagination of the nation before 1911. At the same time, these two chapters also prompt the question: once the nation-state became a (sordid) political reality after 1911, did the new political situation and nationalism actually spell the end of the cosmopolitan genre and utopian literary representations of the world? When considering the thorny intersection of cosmopolitanism and nationalism, it is significant to consider the dystopian narratives prevalent in late Qing political fiction, and examine the ways in which they engaged in, reflected, or critiqued reform and governance efforts intended to put China on the world stage in the last decade of the Qing. Yeh notes in passing the social exposés of Li Boyuan and Wu Jianren, but maintains that they “remained within their original genre convention by not offering a utopian perspective or specific guidance” (230). Perhaps it is instructive to observe that Li Boyuan’s panoramic dystopian social novel, Short History of Civilization (文明小史), displays “surface” features of the worldly space and mobility that Yeh delineates (intra-national adventures of the protagonists, Chinese interactions with foreigners, an adoption of Western ways, etc.). Rather than offer a utopian perspective, a social exposé novel such as Li’s might have been intentionally politically provocative and critical of the reform era, focused as it was on the corruption and chaotic developments in local counties and urban centers associated with modernization. Chapter 5, “Women and New China,” and Chapter 6, “In Search of New Heroes,” combine to suggest the political novel’s narrative capacity to create new heroes and heroines as a means of transforming the political mindset of Chinese readers. The two chapters present an array of new heroic figures and foreign protagonists adapted to late Qing political novels—the woman anarchist, the lone heroine, the foreign political rebel, the scientist-hero, and the urban detective. Rather than revisiting how real historical figures such as George Washington and Napoleon were discussed by reform-minded intellectuals like Liang Qichao, these two chapters expand our understanding of the spectrum of Chinese political novels by delving into their popular or fantastic characters. The Chinese genre’s renewed focus on non-historical protagonists as Yeh portrays it is reminiscent of Georg Lukács claim in The Historical Novel of the prominent roles played by middling characters rather than famous historical figures. Likewise, in toned-down rhetoric, Yeh offers a more transparent sociopolitical interpretation of the new heroes and heroines, who were seen to embody the requisite “core qualities” (“moral uprightness,” “modern knowledge,” “youthful energy”) for “leader[s] of China’s renovation” (314). The comparatively more cursory last chapter, “Beginning of the Beginning: The Wedge Chapter,” offers an insightful look into the stylistic feature of the traditional wedge chapter (楔子), appropriated in modern Chinese political novels under the pressure of political imperatives. Yeh argues that the traditional device of the wedge, which used to guide readers to decipher the meaning of the text at the outset, was preserved and redeveloped in the new political novel as a crucial narrative device that instructed readers on the correct political lessons to be drawn from the text. The new wedge was necessary for the novel’s new evolutionist plot engine, Yeh asserts, because social Darwinism had become the common faith for most enlightened intellectuals in China and East Asia. The wedge was strategically important for novelists to foreclose any uncertain interpretations before readers entered the open-ended linear trajectory of political novels dealing with the present and the future, not the past. Novelists “thus replaced a fictional narrative with a linear promise but an unpredictable end by a linear narrative that led to an end that had been announced from the outset” (325). Yeh believes that the new wedge offered a solution to narrate the progress of history with “the switch from an analytical to a prescriptive scenario” (325), thus closing off the open possibilities of interpretations otherwise allowed by the modern novel. One might additionally ask if, instead of resolving narrative uncertainties, the new wedge could be symptomatic of the problématique of narrating the present and imagining the future within the a priori parameters of an evolutionary logic. As an allegorical summary, the wedge ultimately points to the novelist’s inability to figure events from the present to the future to any reader’s complete satisfaction. It piques one’s curiosity to ask whether, among other reasons, it was the daunting challenge of narrating the present to the future—in a “Chinese recasting of the social Darwinist plot engine” (325)—that led to many writers being unable to finish their works. The wedge in these novels provided, paradoxically, a complete introductory account for an incomplete work. Yeh seems to ignore the potential narrative crisis by praising the productive function of the wedge as it was used by authors, who were apparently more capable of giving a conclusive ending in the beginning chapter than they were in realizing their political ideas with fully-fledged works. Yeh is unconvincing when she claims that “even the many Chinese political novels that had started serialization but were never finished had their supposed political harvest in the bower before the plants of the narrative had matured” (ibid). Indeed, what is found wanting in Yeh’s book is an inquiry into the narrative crisis of the political novel and the genre’s predicament of foreclosing the future. It may explain why certain exemplary works of the genre were dedicated to a futuristic mode by setting their stories in an imagined utopia, because it allowed them to bypass the abysmal state of the present and the past and foresee/foreclose what should happen in the future. Actually, as Yeh rightly points out, the new wedges often synopsized the narratives in allegorical and allusive terms rather than as programmatic plots of progress, as demonstrated in her analysis of Liu E’s Travels of Lao Can (老殘遊記) and Jin Songcen/Zeng Pu’s Flower in the Sea of Retribution (孽海花). All in all, Yeh’s impressive study of the political novel that once flowered in early twentieth-century China offers a synchronic view of the genre’s development, thematic features, and narrative modes. The book contributes to the study of the origins of the modern Chinese novel in general while simultaneously delineating a methodology for positioning Chinese literature on the global map. The inclusion of a motley group of imaginative genres encompassing science fantasies, detective fiction, woman anarchist tales, and futuristic utopias testifies to the generic fluidity of the political novel as well as its capacity for synthesizing other genres for political advocacy. Yeh’s flexibility of categorization is warranted, because when the genre flourished on the late Qing literary stage it was classified or advertised under different labels in the media. Yeh focuses on the issue of what makes the political novel an imaginative fiction of political conviction or provocation by delineating her set of core features or generic resemblances universally characteristic of the form. The breadth of Yeh’s framework at times seems so daunting as to defeat its purpose of fleshing out and delineating shared nuances and complexities among individual works taxonomized under the broad rubric of political fiction—by nature a multiverse of generic hybridity. Readers seeking traces of modern storytelling in the political novel would demand more vigorous analyses in Yeh’s case studies of the stylistic innovations in late Qing fiction, including the changing roles of the narrator, in order to justify her call to save the form from its marginalization in literary scholarship (351). Patrick Hanan’s pioneering study is worth recalling in this light; he offers insight into Wu Jianren’s experimental use of subjective narration in his social exposé and utopian fantasy, demonstrating how late Qing novelistic form confronted—without satisfactorily resolving—the problem of dissonance between individual and society. Readers of Yeh’s solidly comprehensive work can also ponder a diachronic development of the political novel and historical mutations of the genre, contrary to Yeh’s forthright declaration of its demise after 1911. For instance, the dominant modes of futuristic travel and dream narratives found in late Qing political novels have insinuated their way into contemporary subgenres of time-travel known as “crossing over” (穿越) in TV, films, and novels, some of which have been banned by the Chinese government for the obvious ‘political’ implications of imagining an alternative reality in time and space. This contemporary extension of the genre aptly shows the immense and potential value of Yeh’s work, which conceives the genre as a path-breaker of modern Chinese fiction, popular media, and world literature. Michael McKeon, ed. Theory of the Novel: A Historical Approach (Baltimore: Johns Hopkins University Press, 2000), 1. Theodore Huters, Bringing the World Home: Appropriating the West in Late Qing and Early Republican China (Honolulu: University of Hawai’i Press, 2005). Patrick Hanan, Chinese Fiction of the Nineteenth and Early Twentieth Centuries (New York: Columbia University Press, 2004), 162–82. Carlos Rojas, “Queering Time: Disjunctive Temporalities in Modern China,” Frontiers of Literary Studies in China 10, no. 1 (2016): 1–3.